Our trained installers utilize our systems to meet any design or traffic requirement. Our surfaces provide more value in a commercial or high end residential environment than any alternative. Great Lakes trained Elite Crete Systems installers are skilled artisans that do nothing but these finishes. Their portfolio in the field of custom decorative flooring speaks for itself. 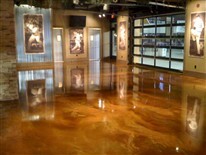 What is Reflector Enhancer flooring?